White thoroughbred colt Wear the Mask has won his second race in in the US, leading all the way to take out an allowance race in Ohio. The four-year-old colt by Airdrie Apache and out of Ms Dubious (Hawkster) led all the way under jockey Megan Fadlovich winning the entry level allowance race by more than 2 lengths at Mahoning Valley Race Course. The final running time was 1:46.42 for the one mile and 70 yards on a track labeled sloppy. Trained by Ivan Vazquez, he is owned by Berva Megson of Megson Farms located in Calvert City, Kentucky, which currently boasts the largest stable of registered white thoroughbreds and broodmare band in North America with more than two dozen as well as standing the 11-year-old Storm Cat-Phone Chatter stallion El Romeo. 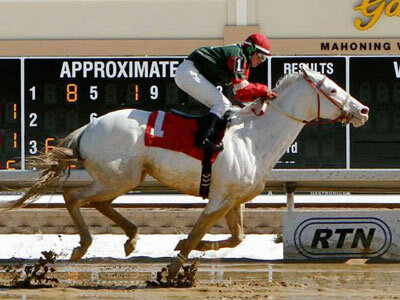 Fewer than one percent of all registered thoroughbreds are white, and no registered white thoroughbred has ever won a stakes race in North America, although a Japanese bred named Yukichan won three stakes races in 2008-2010. Wear the Mask’s sire, Airdrie Apache, is one of the most well-known sires of coloured thoroughbreds. He was a sabino son of white mare Not Quite White, and stood at Desert Oasis Performance Horses in Nevada, along with white Thoroughbred stallion Bright White, until his death at 19 in 2014.